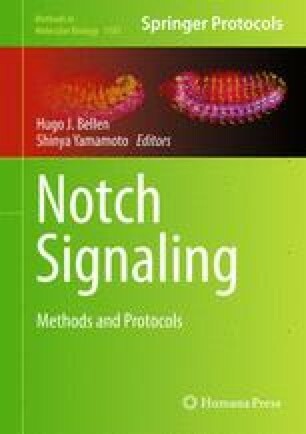 The ability to visualize Notch pathway activity in vivo is invaluable for studying the functions and mechanisms of Notch signaling. A variety of tools have been developed to enable monitoring of pathway activity in Drosophila, including endogenous Notch-responsive genes and synthetic transcriptional reporter constructs. Here we summarize some of the different Notch signaling reporters that are available, discuss their relative merits, and describe two methods for visualizing their expression (immunostaining and X-gal staining). These approaches are widely applicable to a range of tissues and stages in Drosophila development. We would like to thank Hamid Moosavi for contributing data used in Fig. 1.